then only slightly over hop it. Since we love hops, this shows admirable restraint. 100g chocolate malt (remember we’ve been told the key to this is restraint. 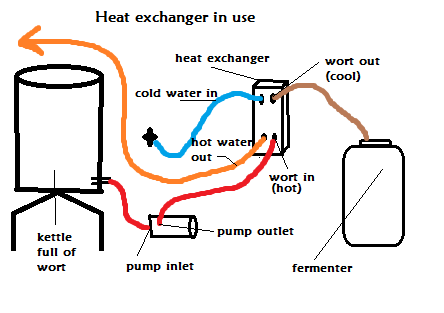 Too much specialty malt and astringent flavours can develop in the finished beer). It has a rather interesting history, but since there is contention about whether it really was Farmer Fuggle, or some other wondrous soul who brought us this glorious bittering agent, I’m going to leave it up to you to go and have a look. Though I imagine he was considerably more weathered by the time he attained the title of Elder. 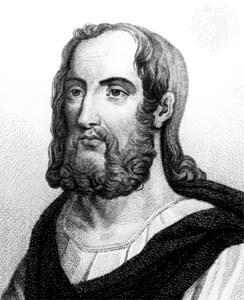 When he first discovered them, Pliny decided to call the liana hop vine Lupus salactarius, translated to “wolf among the sheep”. It has since been renamed Humulus lupulus, retaining the canine connotation in the original name as a kind of homage to Pliny. So we know that hop flowers get added to wort to make beer, but what is it that really separates them from, say, sunflowers, or marigolds? 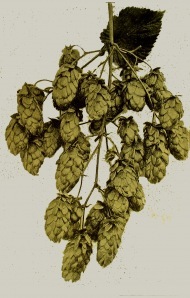 Hops are full of bitter resins, full of α-acids which are produced in the resin glands of hop flowers. These α-acids are what make hop flowers special, and come in a whole variety of chemical structures. This is humulone, one of the most common α-acids found in hop flowers. There are other types of α-acids too, including cohumulone, adhumulone, prehumulone and posthumulone. Different varieties of hops are capable of a whole range of α-acid intensity. Some hops are very mild like the blessed Fuggles with an α-acid rating of between 3.5% and 5%, depending on growing conditions, while some are very aggressive (like New Zealand’s Dr. Rudi with an α-acid rating of over 11%). Before going any further, I want to clear up a misunderstanding that persists throughout the non-beer drinking population. They hear words like “bitterness” thrown around and think that it actually means bitter in the traditional, face pursing yuck way. It’s not really that simple. For me (and obviously this depends a great deal on the type of hops used) the taste of hops in a finished beer isn’t only bitter, it’s something like tart, a little bit floral, and it approaches sourness (but then veers away). Depending on the type and combination of hops used, some very interesting flavour pathways can be activated in the brains of beer fans when drinking. 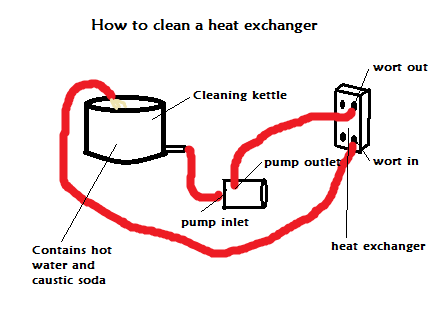 As soon as the boil goes on it’s a good idea to clean your heat exchanger. Neglecting to cool your wort sufficiently once it has come off the boil can result in some nasty dimethyl sulfide flavours forming in the brew. Then turn the pump on and recirculate until you decide your heat exchanger is sparkling clean (internally at least – we don’t care if the outside is splattered with hops). It is vitally important to remember that anything past the cooling phase must be ABSOLUTELY STERILE. 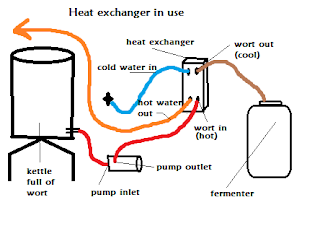 This is because cooled wort is basically a delicious buffet to any unwanted bacteria or wild yeast that wants a party, and these are capable of spoiling the beer during primary fermentation, so it is a very good idea to clean and sanitise whatever vessel you are fermenting in. We use caustic soda (lye) for cleaning, which is a very alkaline, corrosive chemical. You need to wear gloves and eye protection when handling this stuff, even when it’s diluted. Well, maybe not quite that, but you get the idea.